The changing focus and approach of geomorphic research suggests that the time is opportune for a summary of the state of discipline. The number of peer-reviewed papers published in geomorphic journals has grown steadily for more than two decades and, more importantly, the diversity of authors with respect to geographic location and disciplinary background (geography, geology, ecology, civil engineering, computer science, geographic information science, and others) has expanded dramatically. As more good minds are drawn to geomorphology, and the breadth of the peer-reviewed literature grows, an effective summary of contemporary geomorphic knowledge becomes increasingly difficult. 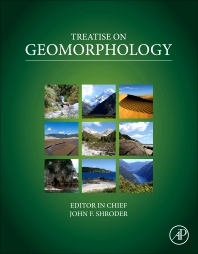 The fourteen volumes of this Treatise on Geomorphology will provide an important reference for users from undergraduate students looking for term paper topics, to graduate students starting a literature review for their thesis work, and professionals seeking a concise summary of a particular topic. Information on the historical development of diverse topics within geomorphology provides context for ongoing research; discussion of research strategies, equipment, and field methods, laboratory experiments, and numerical simulations reflect the multiple approaches to understanding Earth’s surfaces; and summaries of outstanding research questions highlight future challenges and suggest productive new avenues for research. Our future ability to adapt to geomorphic changes in the critical zone very much hinges upon how well landform scientists comprehend the dynamics of Earth’s diverse surfaces. This Treatise on Geomorphology provides a useful synthesis of the state of the discipline, as well as highlighting productive research directions, that Educators and students/researchers will find useful. No other reference work exists in the area of Geomorphology that offers the breadth and depth of information contained in this 14-volume masterpiece. From the foundations and history of geomorphology through to geomorphological innovations and computer modelling, and the past and future states of landform science, no "stone" has been left unturned! 1.9.4 Spacetime Scales: Where and How Do We Go From Here? 2.5 Which Models Are Good (Enough), and When? 2.5.2 What Does It Mean for a Model to be Wrong? 2.5.3 What Makes a Model Rigorous? 2.10.2 Why Model Soil Erosion? 4.1.2 What Constitutes Weathering Geomorphology? 4.9.4 Soil Variation on Catenas – Why? 4.15.4 Where are We at and Where are We Going? 6.18.3 Why Is It Important to Study Caves in High-Relief Areas? 8.13.1 Why is Periglacial Hydrology Unique? 8.25.3 Why Is There Aeolian Activity In Periglacial Environments? 8.28 The Glacial and Periglacial Research Frontier: Where from Here? 9.5.4 How Well Do Standard Equations Predict Total Resistance? 9.19.2 Why Do Rivers Anabranch? 9.27.1 Introduction: What Is a Steep Headwater Channel? 9.27.3 How Do Steep, Headwater Channels Function? 9.36.5 The Rise and Fall of Classifications: Why Are Some Channel Classifications More Used Than Others? 10.6.3 What Mechanism(s) Related to Waves, Currents, and Sediment Transport in the Nearshore Lead to the Formation of Nearshore Bars? 10.6.4 How Do Controls Such as Sediment Size, Nearshore Slope, and Wave Climate Determine Whether Nearshore Bars Form on a Sandy Coast? 10.6.5 What Are the Mechanisms Related to Waves, Currents, and Sediment Transport That Control Morphological Change in Nearshore Bar Systems on a Time-Scale of Hours to Weeks and Months? 10.6.6 How Do Factors Such as Sediment Size, Nearshore Slope, and Wave Climate Interact with the Short-Term Morphodynamics to Control the Number, Size, and Spacing of Bars in the Nearshore and Intertidal Zones? 10.7.2 What is a Tidal Inlet? 12.9.3 What Earth-Surface Processes Have Been Analyzed with Tree Rings? 12.17.2 What Are Microbes and Why Are They Important to Geomorphology? 13.17.5 Catastrophic Rock and Ice Avalanches – Growing Evidence of Climate Change Effects? 14.5 Google Earth™ in Geomorphology: Re-Enchanting, Revolutionizing, or Just another Resource? John (Jack) F. Shroder graduated from Union College’s Geology Program in 1961, received a Masters degree at the University of Massachusetts – Amherst in 1963, and a doctorate at the University of Utah in 1967. His first academic job was two years at the University of Malawi in Africa, before he joined the faculty at the University of Nebraska at Omaha (UNO) in 1969, where he remained for most of the next four decades. In the late 1970s he also spent several years on an NSF grant and a Fulbright at Kabul University in Afghanistan and then in 1983-84 he had another Fulbright to Peshawar University in Pakistan. These experiences led to many years of research in the Hindu Kush and western Himalaya which continued through a host of grants and the thick and thin of the interminable war years and terrorist threats over there. Finally in the post 9/11 world, the difficulties of dealing with the increasing terrorism and avoidance of problems in the field forced a cessation of further work in those difficult countries. Also the declining US economy led to so many other problems at UNO that in summer of 2011, Dr. Shroder stopped teaching his required geology major courses and attempted to retire to his and his wife Susie’s new house in Crested Butte, Colorado. This lasted barely a month before UNO pressured him to return at a vastly reduced part-time salary to once again cover his geomorphology class for the fall semester, 2011. But in the interim, Jack had begun a new editing career for the Elsevier publishing company so that he was spending more of his time producing new volumes of work in geomorphology and hazards analysis. With 30 volumes written or edited by 2012, and 9 more deep into the planning stages, the future of such work for him in his retirement years seems certain. These books go together with the more than 150 other scientific papers he is continuing to publish. Dr. Shroder is a Fellow of the Geological Society of America and the American Association for the Advancement of Science. The Board of Trustees of the Foundation of the Geological Society of America also asked Jack to join them for the next six years as well, so his deep interests in geology will be maintained. The Association of American Geographers has given Dr. Shroder distinguished career awards twice, once for their Mountain Specialty Group in 2001, and again for their Geomorphology Specialty Group in 2010.